I was honored to present my dissertation research at the MACRO conference in Madison, WI. yesterday. There were a lot of great discussions about popular music, and the use of composition in the the theory classroom. Thanks to MACRO (macromusic.org) and Jamie Henke of the University of Wisconsin-Madison for organizing this event. 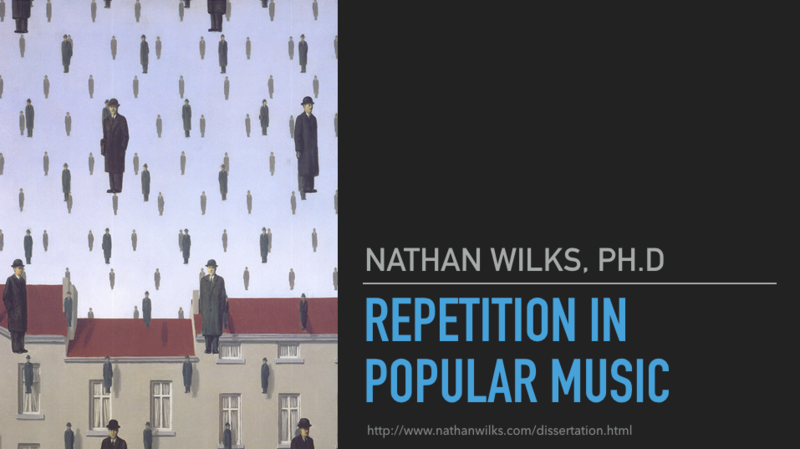 After far too long, I've completed my dissertation on repetition in popular music. Repetition is one of the most important yet undervalued elements of music (even frowned on by some). Of the many articles and books I used in my research, only a handful dealt with repetition directly—which is unsurprising given that it's a rather unwieldy topic. In my paper, all musical phrases are either new, repeated literally, or some kind of varied repetition (which fall into two categories based on its formal uses). Through this analysis, I found that in verse-chorus songs, every new musical phrase you hear is repeated verbatim once (approximately) with the rest being some kind of varied repetition. The paper also delves into aspects of form, musicology, and psychology. For those interested in reading more, you can download the entire document here. Honored to have my newest piece, Vague Recollections, premiered at Salty Cricket's Living Masters Concert with Samuel Adler. I'm very grateful for the spectacular performance by Alex Martin and Miaomiao Wang. It was great to meet Prof. Adler and mingle with the other composers, Aaron Kirschner and Sam Richards. While in SLC, I also presented a lecture at Utah Valley University on my dissertation, repetition in verse-chorus forms. It was a long week but well worth it. It's been a turbulent holiday season to say the least, but I finished up the commission for a violin and piano piece last night. Two months from start to finish is relatively fast for a ten minute piece, especially when working on my dissertation as well, but sometimes quick pieces tend to be good. I'm looking forward to hearing it performed in March at the Salty Cricket Living Masters Series with Samuel Adler. The Fry Street Quartet did a fantastic job performing the second movement of my second string quartet. Thanks to the University Composers Collective at the University of Utah for putting the concert together. It's been a busy month... Last week I was in Salt Lake City for a performance of Disco Lung, my trio for flute, bass clarinet, and piano. It went very well and in fact won the audience choice award. I'm very grateful to Salty Cricket Composers Collective for putting on the concert and supporting local composers. I'll post the recording soon. I'll be in SLC again next week for the premiere of my second string quartet. The Fry Street Quartet will be performing and I'm very exited to hear it. It's a strange feeling to hear your piece for the first time; you know it so well and have poured over every detail but have only heard echoes of it in your head or imperfect computer mock-ups. It's the difference between what sits in a drawer and what hangs in a gallery. Typically, this is where some thought-provoking tidbit about music would go, and I'll try to keep it that way. If months go by without an update, that doesn't mean nothing is going on; on the contrary, it means too much is going on. If that happens, send me a message and let me know you require thought-provoking tibits. 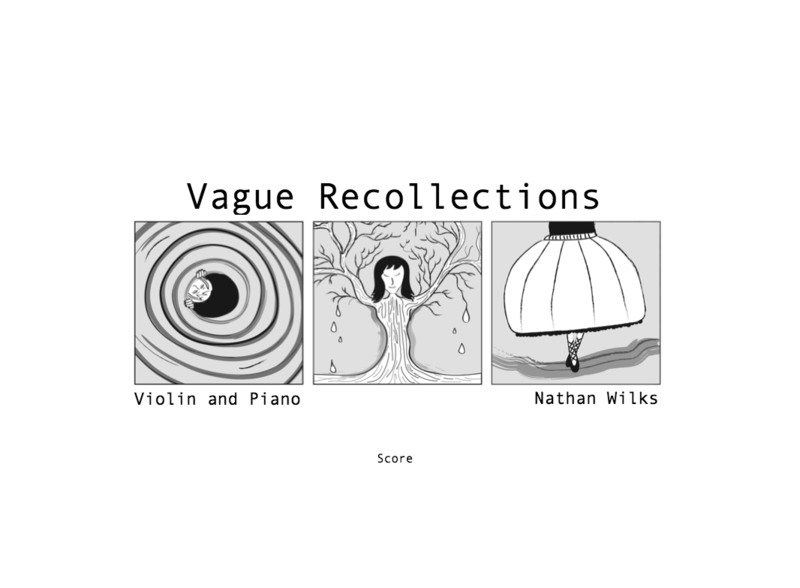 Nathan Wilks is an American composer and pianist living in Dallas. Nathan has been teaching for nearly a decade, including private lessons and college classes. He is a graduate of Texas Christian University (MM) and a Ph.D candidate at the University of Utah.